Also serving communities of Augusta, Towanda. There are 19 Assisted Living Facilities in the Andover area, with 4 in Andover and 15 nearby. The average cost of assisted living in Andover is $3,400 per month. This is higher than the national median of $3,345. Cheaper nearby regions include Newton with an average starting cost of $3,162. To help you with your search, browse the 83 reviews below for assisted living facilities in Andover. On average, consumers rate assisted living in Andover 4.2 out of 5 stars. Better rated regions include Derby with an average rating of 4.4 out of 5 stars. Caring.com has helped thousands of families find high-quality senior care. To speak with one of our Family Advisors about assisted living options and costs in Andover, call (855) 863-8283. Nestled in Butler County, Kansas, lies Andover, a small city with 12,745 residents. Seniors can explore one of the city's six parks, participate in community events like Greater Andover Days or learn interesting facts at the Andover Historical Museum. After a day of fun, many seniors head home to one of Andover's four assisted living facilities or one of the additional 19 communities located near the city. 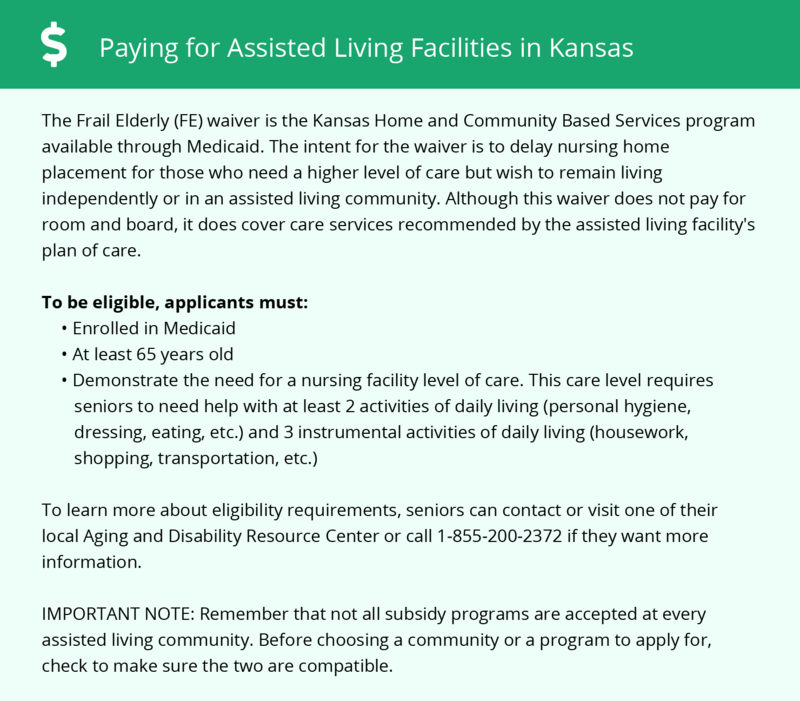 These facilities provide a safe, welcoming environment for seniors by meeting or exceeding guidelines from the Kansas Department for Aging and Disability Services. Temperatures typically range from the 20s to 80s in Andover, but sometimes they drop to single digits in winter and rise to triple during summer. Seniors who like outdoor activities may prefer the spring and fall months, as this is when temperatures often sit between the 50s to 70s. Andover is safer than more than 4 out of 10 U.S. cities. It has a crime index of 42 on a 100-point scale, and most crimes involve property damage rather than violent incidents. There is a 1 in 263 chance of being a crime victim in Kansas but only a 1 in 865 chance in Andover. Transportation options are limited in Andover, but residents can use the The Butler County Transit Program run by the Butler County Department on Aging. Reservations for rides are accepted Monday through Friday between 8:30 a.m. and noon. The company recommends scheduling your ride at least 24 hours ahead of time. Andover has few facilities from which to choose in the event of a medical emergency or illness, with the nearest major hospital located in Wichita, Kansas. Andover seniors spend less on housing, health, groceries and utilities than the national average for other U.S. cities. However, on average, it has a higher cost of living than Kansas as a whole. Low-income seniors receive property tax relief through the SAFESR program. This program offers a rebate covering 75 percent of qualifying personal property expenses paid each year. Also, Social Security benefits aren't taxed for seniors who earn $75,000 per year or less. Assisted Living costs in Andover start around $3,400 per month on average, while the nationwide average cost of assisted living is $4,000 per month, according to the latest figures from Genworth’s Cost of Care Survey. It’s important to note that assisted living rates in Andover and the surrounding suburbs can vary widely based on factors such as location, the level of care needed, apartment size and the types of amenities offered at each community. 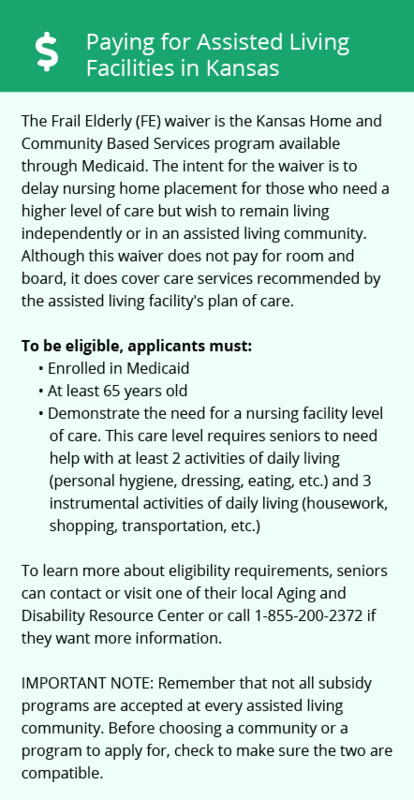 Qualified Medicaid members combat assisted living expenses with help from the Frail Elderly Waiver program. This program offers coverage at approved assisted living communities throughout the state of Kansas, not just in Andover. Seniors enrolled in this program also receive services that help them maintain their oral health and overall well-being. Learn more about these programs, plus who’s eligible, on our Assisted Living in Kansas page. For more information about different ways to finance assisted living, visit our Assisted Living in Kansas page. Andover and the surrounding area are home to numerous government agencies and non-profit organizations offering help for seniors searching for or currently residing in an assisted living community. These organizations can also provide assistance in a number of other eldercare services such as geriatric care management, elder law advice, estate planning, finding home care and health and wellness programs. To see a list of free assisted living resources in Andover, please visit our Assisted Living in Kansas page. Andover-area assisted living communities must adhere to the comprehensive set of state laws and regulations that all assisted living communities in Kansas are required to follow. Visit our Assisted Living in Kansas page for more information about these laws.